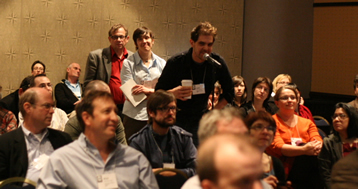 There were plenty of opportunities at MW2010 for people to meet, discuss and debate. Mini-Workshops introduced tools, methods, or techniques. The Crit Room featured a review of museum Web sites in "real time" and testing of attendees' Web sites took place in the Usability Lab. Issues were hashed out in Professional Forums. Exhibitors presented updates on their projects in Briefings. Birds of a Feather Tables provided a place for informal conversation. For more details about types of presentations see the Description of Session Formats. Should we be organizing a Museum Commons? Museum Commons: Tragedy or Enlightened self-interest? Groups formed for some informal conversation around a topic or theme. Delegates proposed a subject, or joined a table with a topic that was intriguing and met others with sharedinterests. BoF topics were proposed in the on-line community. Experienced Web designers and new media managers reviewed real museum Web sites and offered their comments in the "Crit Room". Modeled on the art school critique, Web sites were volunteered in advance by MW2010 attendees who were present to pose the problem and respond. volunteered sites to be tested. Each user test lasted about 20 minutes (with time for comments and questions), and people moved in and out of the session. Sites to be tested were not evaluated in advance and volunteer users were selected at random. The "user" left the room while the owner of the site describes what they consider a typical scenario – something the average user would be trying to do. This scenario was converted into a task and given to the user to perform along with some randomly selected standard tasks. After each test, the user, site owner, test administrators and audience discussed what was learned. A variety of testing techniques were demostrated, emphasizing the thinking-aloud method so it was easy to follow along with the test subject. For more information about this technique, see Marty and Twidale's article Usability@90mph in First Monday. Skill and method were presented in these participatory sessions. There are formal sessions for the rest of Saturday. On the spot groups were formed in un-conference session on Thursday. Ideas were 'pitched' in a facilitated plenary session, and then self-organized groups got together in breakouts. See more details on the conference.archimuse.com community site. Museum sites were shown by the people involved in their creation in MW2010 Demonstrations.